We have a cave background now. Woohoo. This brings us most of the way towards having the cave environment done, although we have essentially no enemies/traps for it at the time being. Like most things parallax, a still screenshot doesn’t quite do this justice; it doesn’t convey the sense of depth this has ingame. Edit: I also drew a new font. The old font was quite typographically schizophrenic and just plain amateur; this font tries to actually follow rules like having consistent x-heights, and consistent ascender/descender lengths. The previous one was just a quick hack job to finish any small font at all, so we could implement the text-label object (which lets us place arbitrary text labels on levels). This entry was posted on Monday, March 1st, 2010 at 8:24 pm	and is filed under Uncategorized. You can follow any responses to this entry through the RSS 2.0 feed. Responses are currently closed, but you can trackback from your own site. Thanks – I appreciate it. Speaking of stuff; I followed the link to your magazine; very cool stuff. 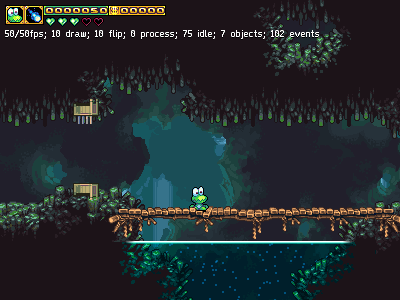 As far as licenses go, the released PC version of frogatto will be freeware, so please do redistribute it on your CD when we’re actually done (you’ll be able to tell; we’ll do a big release announcement). We’re leaving the PC version of the game free as a sort of promotional tool for the iPhone (and any other potential console platforms) version. We’d really appreciate that, if you think it’s worthy of going on there – we could use all the word-of-mouth we can get. The game isn’t completely self-explanatory yet, but I have a thing or two in mind to add to the game to help with that. We’re trying to make it as self-explanatory as “Kirby’s Adventure” for the NES, but we’re not going to go much further than that, because anything more is wasted effort chasing the “long tail” of player adaptability.